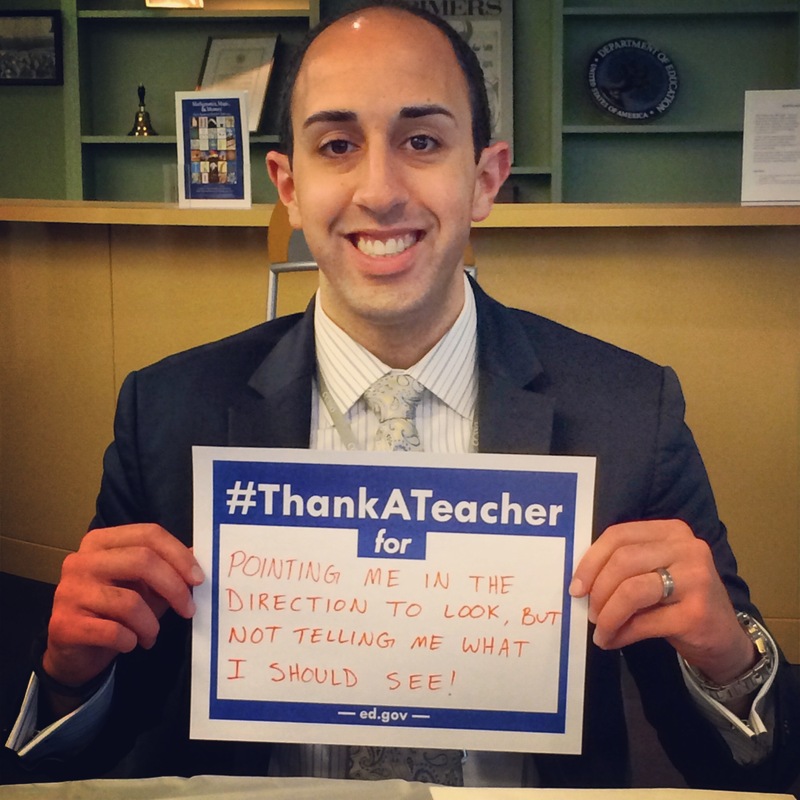 A #TeacherHero Who Made a Difference For Me | Gary G. Abud, Jr. This entry was posted in Education Learning MichEd Teaching and tagged Education Learning TeacherHero Teachers TLC2014 on May 6, 2014 by Gary G Abud Jr. This week’s Teacher Leadership Challenge asks education bloggers about a #TeacherHero, and to think about teachers who make a difference in the lives of others. When I was in high school, I was enduring a really tough time with my vision, due to a condition in my corneas that eventually required a surgical solution. It made it difficult for me to read books, the board, and see just about everything. Despite my vision, I chose to take challenging Advanced Placement (AP) courses, like AP Literature. My ability to read was significantly hindered by my vision, and so taking college-level literature class was perhaps not the wisest choice. That being said, I entered the class enthusiastic and, perhaps, a bit out of my league. Not being really interested in literature, reading, or writing in general, I knew this course was going to be a challenge, and I considered dropping it early on when the going got tough. But the teacher of this class, Andy Montague, was a true master of his teaching craft. He had only the highest of expectations for the kids in our class and never let up on them. When a learning task seemed insurmountable, he guided us through without telling us. He pointed us in the right direction, but never told us exactly what to see. We sat in class, divided into two teams, facing one another and discussing, sometimes arguing over, literature. His teaching was so passionate for the subject and for engaging us in the conversation about literature that we couldn’t help but be drawn in. The more we contributed to class discussions, the more we learned, but also the more he pushed us to think differently about literature. Even at times when we disagreed on a point in a book or passage, he helped us to think things through and wasn’t directive. As the year went on, it became my favorite class and I was glad that I didn’t quit. Andy Montague got me books on tape, helped me get accommodations for larger print versions of the AP Literature test and even coached me through the in-class work that I couldn’t easily see to read. He gave focused feedback on my writing that went beyond what I would have expected as a student. My writing, reading, discussing, and thinking all improved so much during the course of that year. I became a more confident writer and speaker because of his class. He allowed us to express our ideas not just with him but with each other. He facilitated class discussion and allowed us to access the learning in our own way. It was inspiring, now that I think of it as a teacher myself looking back. By the end of the year, I felt so confident about my writing skills and my ability to wordsmith, I decided I was going to audition to give the commencement address at graduation. The day before I was to submit a proposal for the speech, I got cold feet about my writing, thinking that there were other writers who I had seen in AP Literature who I thought were better at it than I, and I decided that I was not going to submit a speech. In class, I mentioned my decision to Mr. Montague and he encouraged me to reflect on my own ability and pushed me to submit a speech. He stopped what he was doing during our study hall and looked over my draft to give me feedback on my speech. I submitted my speech to the selection committee, and I was selected from all the students who auditioned. I got to give the commencement address at my high school graduation. That push through my hesitation and doubt helped me to grow in my confidence as a writer and speaker. It let me know that I could accomplish what I set out to do then and in life. That experience propelled me in college to have more confidence in my writing and speaking, though I still struggle with properly using the comma, sometimes. When I considered becoming a teacher myself, I thought of Andy Montague and what an inspiring educator he is. Then I applied to the college of education program and had to interview with an admissions panel who asked me to describe great teaching in action. I spoke of Andy Montague as an exemplary teacher I had in my career and what he did that stood out to me. Now, as a classroom teacher myself, he still remains one of the best teachers I have ever known. I have the privilege of working around the corner from Mr. Montague now, as I teach at my alma mater. I try to emulate his enthusiasm, engagement, and question style in my own teaching now. And while I have had many great teachers in my time as a student, and great teachers in my career as an educator, learning under Andy Montague was a pivotal experience in my life. This year, I have had the opportunity to do a lot of writing, give a lot of speeches, and do a lot of discussing and thinking in my position as the 2014 Michigan Teacher of the Year. I’m not sure I could have made it this far if my AP Literature teacher hadn’t been a #TeacherHero. And for that, Andy Montague, I thank you! Image Credits: Gary G. Abud, Jr.